In metro systems, automation refers to the process by which responsibility for operation management of the trains is transferred from the driver to the train control system. There are various degrees of automation (or Grades of Automation, GoA); these are defined according to which basic functions of train operation are responsibility of staff, and which are the responsibility of the system itself. For example, a Grade of Automation 0 would correspond to on-sight operation, like a tram running on street traffic. Grade of Automation 4 would refer to a system in which vehicles are run fully automatically without any operating staff onboard. Unattended Train Operation has many benefits and many beneficiaries: customers, operators, funding authorities and staff. The implementation of UTO systems allow operators to optimise the running time of trains, increasing the average speed of the system, shortening headways up to 75 seconds, and reducing dwell time in stations (in optimal conditions) to 15 seconds. By taking the human factor out of the driving equation, operators gain flexibility and can make better use of assets. UTO systems offer a more tailored service coverage, reducing overcapacity supply at off-peak hours and enabling operators to inject trains in response to sudden surges in demand, for example in the case of big events. UTO systems also offer safer operations by reducing the human-risk factor; well designed UTO systems have proven to be more reliable than conventional metros and hold an impressive safety record. Platform and track incidents aside, there has been only one operational incident in Osaka, at the end of the 80s, when a train did not stop at terminus and hit a bumper stop, provoking injuries in a few dozen passengers.. Overall, passengers perceive an increased quality of service, thanks to the enhanced reliability of trains and shorter waiting times in platforms. The re-deployment of staff in stations also increases passenger’s level of subjective safety and security. – Rolling stock – An increase in commercial and average commercial speeds, reduced headways and the optimal distribution of reserve train sets along the lines translate in gains in the fleet. Thanks to higher reliability, it is possible to achieve more capacity with the same (or even reduced) fleet size; the technical reserve (spare vehicles) can also be downsized. – Signalling and control systems – Full UTO represents a higher cost than traditional ATP systems. However, the current trend is to install CBTC systems on new lines – even with drivers (GoA2). The signalling technology being basically the same, the cost difference is marginal in the case of a new line. 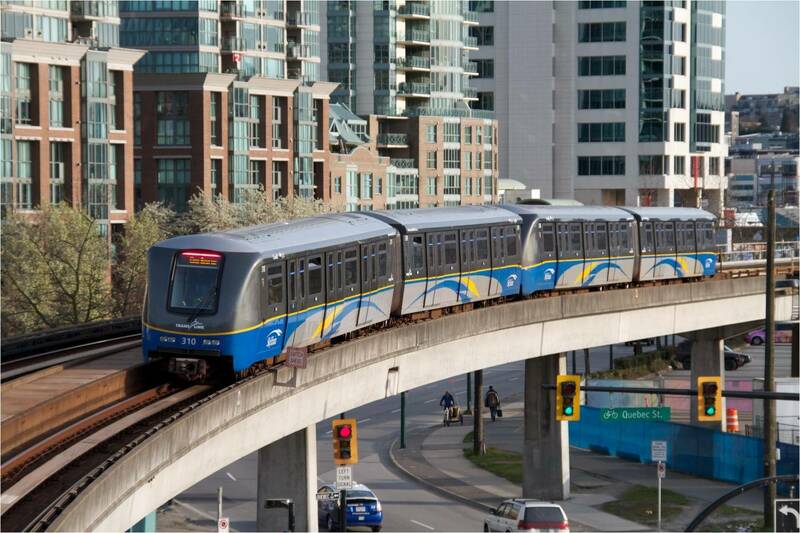 – Platform & track protection systems – The need to replace the role of the driver in preventing platform and track incidents represents the highest civil engineering cost increase. Metro also becomes affordable for smaller cities: when trains run more frequently, the system does not need to be “oversized” to cope with peak demand. Accordingly, civil structure works can be of smaller scale. Line conversion poses a more complicated business case. It is necessary to factor in extra costs due to the technical difficulties connected to the modification of the existing signalling and control systems and the need to replace or retrofit existing rolling stock, as well as the increased cost and complexity of installing platform and track protection systems in older stations. To minimise its impact, conversion projects should be timed to the end of the life cycle of the existing equipments. For conventional lines that upgrade to UTO in parallel with the renewal of rolling stock or signalling equipment, it is estimated that the return on investment period is around 10 years. (The automatism costs being offset by gains in rolling stock fleet, this figure refers to the extra cost of retrofitting PSD into existing stations). When factoring in operational costs, automated lines come clearly ahead of conventional lines; some studies indicate a halving in operational costs. Staff costs are greatly reduced thanks to the abolition of the drivers’ function, even in cases of line conversion, when staff is likely to be retrained and deployed to other functions. Acceleration and deceleration patterns can be adjusted to reduce energy consumption and maximise energy recovery, thus significantly reducing energy costs. While maintenance costs are marginally increased due to the introduction of platform and track protection systems, the overall balance is positive thanks to the gains in personnel and energy costs. Implementing UTO (as a new system or retrofit of an older line) is a major milestone in the life of the operating company. The introduction of a more sophisticated computerised system and Operation Control Centre (OCC) should be an opportunity to review most operation processes and assess how they can be improved and “plugged in” to the system in order to extract maximum benefit from the data process capabilities installed, and also yield better performance at optimised costs. The main operation areas likely to be affected are: operation resource planning, staff training, rolling stock management, maintenance management, quality management. The introduction of UTO requires some significant changes to the qualifications of staff. Routine driving work disappears and staff is no longer locked inside a cabin, but deployed along the line and in contact with customers. Front-line staff needs a customer-oriented profile and some technical knowledge to be able to reset defective equipments (e.g. escalators) or drive in case of failure. OCC staff requires demanding qualifications and skills to be able to perform emergency operation without the support of on-board staff. In general terms, staff in a UTO line acquires a deeper knowledge of all the key systems, as well as a global overview on the functional interactions among them, allowing for professional growth. In automated lines, operational staff tasks also evolve towards maintenance. Two fields of activity totally separated in a traditional line merge, having a positive impact in the staff (who has a more diverse profile) and the line. As a consequence, UTO raises the attractiveness of the job profiles, and of the operator company as an employer, contributing to staff motivation. In those systems where it is possible to compare with conventional lines, the indicators show that UTO line staff are more satisfied with their job and translate into reduced levels of absenteeism. 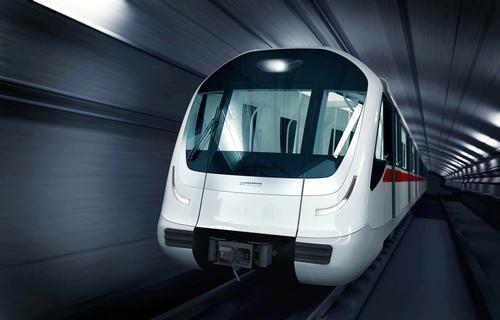 Automatic Train Protection (ATP) is the system and all equipment responsible for basic safety; it avoids collisions, red signal overrunning and exceeding speed limits by applying brakes automatically. A line equipped with ATP corresponds (at least) to a GoA1. Automatic Train Operation (ATO) insures partial or complete automatic train piloting and driverless functionalities. The ATO system performs all the functions of the driver, except for door closing. The driver only needs to close the doors, and if the way is clear, the train will automatically proceed to the next station. This corresponds to a GoA2. Many newer systems are completely computer controlled; most systems still elect to maintain a driver, or a train attendant of some kind, to mitigate risks associated with failures or emergencies. This corresponds to a GoA3. Automatic Train Control (ATC) performs automatically normal signaller operations such as route setting and train regulation. The ATO and the ATC systems work together to maintain a train within a defined tolerance of its timetable. The combined system will marginally adjust operating parameters such as the ratio of power to coast when moving and station dwell time, in order to bring the train back to the timetable slot defined for it. There is no driver, and no staff assigned to accompany the train, corresponding to a GoA4. At Grade of Automation 4, ATC systems work within an overall signalling system with interlocking, automatic train supervision, track vacancy detection and communication functions. The Operation Control Centre (OCC) supervises the overall train running and provides automatic train supervision (ATS) functions. The ATP, ATO and ATC functions are performed by on-board and wayside equipments which exchange data. – Train borne level – providing ATP, ATO and human-machine interface (HMI) functions on board the trains. 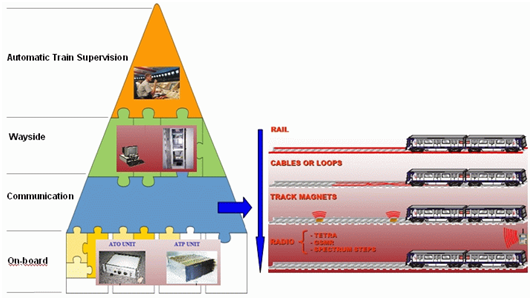 Various types of communication between track and train. Progress of Information and Communication Technology (ICT) means that traditional equipments such as induction loops or beacons are increasingly replaced by radio communication.